When it comes to bottled water, most experts are in agreement that glacial sources are the purest and healthiest. Unfortunately, glacial sources tend to be difficult to find, and they tend to be even more difficult to collect. 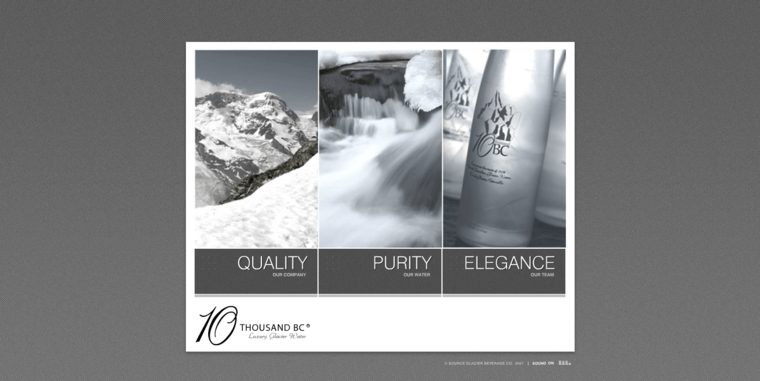 10 Thousand BC knows this better than any other brand. They only collect their water from a sole glacial source that is exceptionally difficult to access since it is located on the floor of the sea. It took quite some time for them to determine the best methods for collection, but they finally were able to customize certain pieces of equipment for the job. After the water is collected and transported to the bottling facility in specialized glass-bottom barges, the water is immediately bottled for distribution. It literally can not be made any purer than it already is with any artificial methods, so there is no need to process the water in any way.